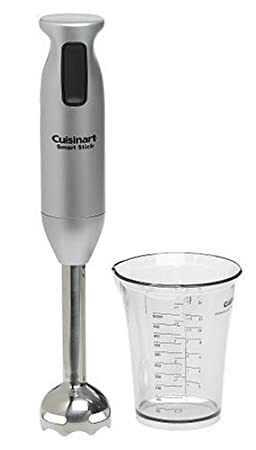 One kitchen gadget I am obsessed with is my Cuisinart SmartStick 200-Watt Immersion Hand Blender . I use this device at least twice a week. I cook a lot of soups and healthy sauces at home and this helps give a silky smooth finish. I purchased mine from Amazon last Christmas for under $30 which included shipping and tax. A few months ago, I posted this roasted butternut squash soup recipe which is a true crowd pleaser. I will never forget the first time I made this recipe. It was before I owned a hand immersion blender so I used my food processor.....you do not want to ever experience butternut squash soup all over your counters and floor, trust me. I ordered a Cuisinart smart stick that night. It is so simple to use inside of the pot you are cooking in (as seen below). You can use your hand blender for a variety of different things and it is dishwasher safe. I love this little guy! The deal on Amazon is great. Also, Costco has the Cuisinart combo for under $30. I have a membership there so let me know if I need to do a little Elf help!